We are now taking enrollment for the new school year! The Jump Start Preschool program is structured for 1st year preschool children and focuses on introducing children to the preschool setting and learning classroom routines. Children will be introduced to Zoo Phonics, early math skills, and guided with positive reinforcement as they interact with other children, become more independent, and grow physically and emotionally. 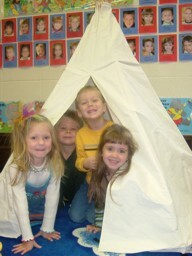 The Pre-Kindergarten Class is an extension of the Jump Start Preschool and also focuses on kindergarten readiness. The children will use the skills learned through Zoo Phonics to practice beginning skills that lead to pre-writing and pre-reading. Beginning math skills will also be extended as well as additional learning experiences that help children grow socially, emotionally, and physically. *$50 non-refundable deposit due upon enrollment. Notify the preschool staff if your schedule conflicts with our start and end times, we are willing to work with you on an individual basis. Mail or hand deliver all 3 pages!